Mexicans know a thing or two about corn chips, but Industrial Engineering Technology (IET) based in Penrith in Sydney’s West is teaching them a few new tricks about baking them. Mexico is just one of the countries the company is targeting for export of a corn chip oven so technologically advanced it is cornering the world market. IET Ultra Ovens has attracted the attention of PepsiCo subsidiary Frito Lay— makers of Doritos—with the head of Global Operations flying to Sydney to inspect four ovens for global operations in Turkey, Indonesia and Mexico. IET’s ovens use patented technology and are designed and made exclusively in Penrith. Another Western Sydney company, ACR Business Systems, was recently crowned the nation’s Champion Small Business of the Decade. It earned this accolade for its proven success in providing end-to-end system software to businesses in the wholesale, retail, manufacturing and telecommunications industries, servicing a diverse range of industry from hardware to confectionery. 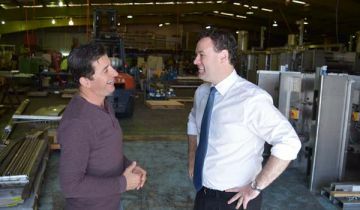 Member for Penrith Stuart Ayres, who recently visited both IET and ACR Business Systems commented, “this incredible end-to-end system software business has taken out the inaugural Champion Small Business of the Decade, an award which recognises excellence in growth, innovation, jobs creation and customer service over the past 10 years”. These two companies highlight the massive growth in small business throughout Western Sydney in recent years, and demonstrate that the Penrith business landscape continues to evolve thanks to the innovation of local operators. With 710,000 small businesses across the state employing 1.5 million people, Penrith is leading the small business success story.